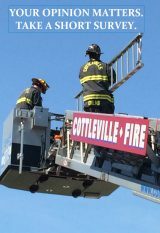 Cottleville Fire District to Serve as a “Toys for Tots” Collection Site! Fire Station #1 and our Administration office located at 1385 Motherhead road. By participating in the gift of giving, you will be helping to make a positive difference in the life of a child in our community this holiday season. Drop off location during daytime hours: “Administration Building”, (Next to the Fire Station #1 at 1385 Motherhead Road. St. Charles. (636) 447-6655. Open M-F 8:00 am-4:30 pm. Drop off location after hours: “Fire Station #1: (Front double door entry vestibule). Open 7-days a week, 24 hours. Vist: Toys for Tots for more information on where your donated toys will go.